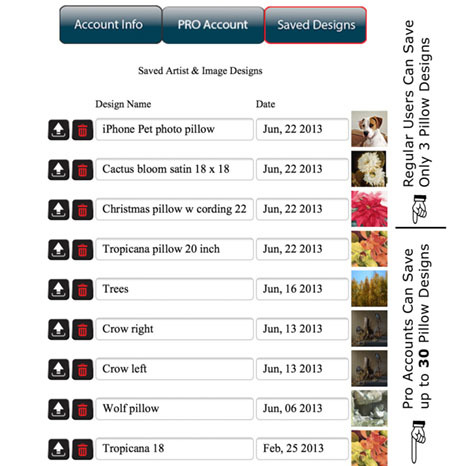 Mypillowprinter.com Pro-Accounts provide artists and photographers with the tools they need to make a business out of selling Art and Photo Pillows. Subscriptions are introductory priced at $79 per year. Please allow up to 3 business days for your pro-account to be activated. • 25% Discount* on your Art and Photo Throw Pillow orders year round. No minimum order required, no black out dates! 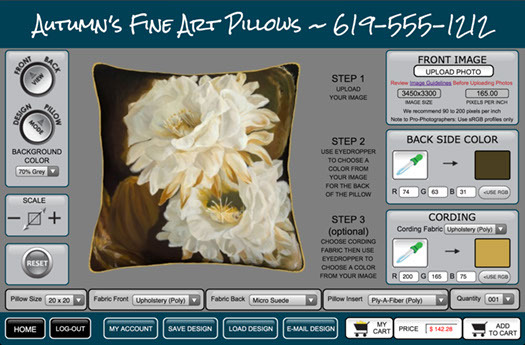 • Private Labeling** of the Art and Photo Pillow design page, so your client only sees your name and not the mypillowprinter logo. Allow your client to be part of the design process while reinforcing your branding. Use the private branding to show your client your pillow designs and customize them with the customer present but without revealing your costs or your source. • Private Pricing You set your mark-up percentage on your pro-account management page and the marked up Art and Photo Pillow price is displayed on your design page so your client does not see your costs. • Discounted Bulk Shipping*** on large orders. Details coming soon. *Pro-Account discounts cannot be combined with other discounts or promotional offers and do not apply to shipping. **Private labeling is designed as a sales tool for one on one sales and is not as a independent web site for selling your Art and Photo Pillows. *** Bulk shipping in vacuum packs does not include tissue or individual packaging. Pillow Hang tags are included with your order.